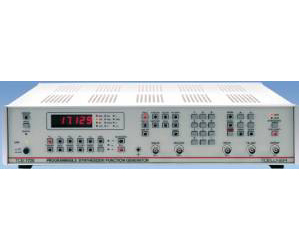 Owing to their standard, integral IEEE bus interfaces, the programmable TOELLNER synthesizers/function generators of the TOE 7720 range are suitable for use in computer-based automatic test and measuring systems. Because they are so easy to operate, the range is also eminently suited to standard laboratory applications. The microprocessor technology on which the whole design is based greatly supports simple operation and repeatably accurate settings and has led to improvements in the entire design. Feedback voltage protection - opt.